The DD 4m x 4m Tarp - the ideal size for a Group/ Work Shelter! This really is a massive tarp and is best suited to e.g. group shelters and work areas rather than as a one person hammock shelter. 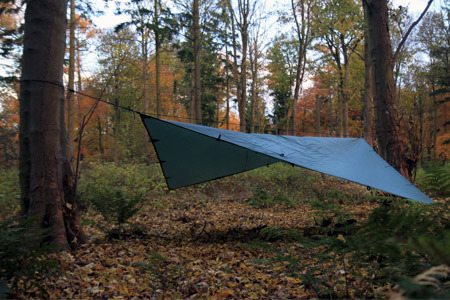 This tarp has 19 attachment points and can be set-up in many different configurations. Made from 190T polyester with PU 3,000mm coating. Seam is taped. Completely waterproof, even in the heaviest storms.